The DHS Eagles put on a great show for an appreciative hometown crowd at this years homecoming match. 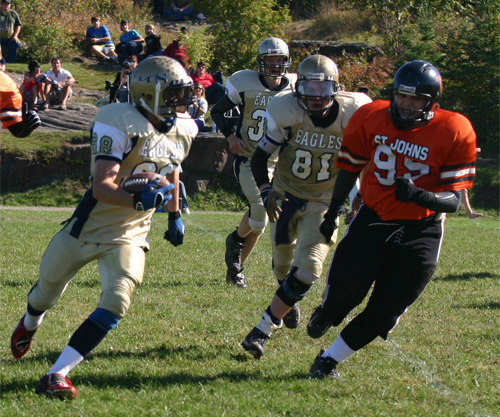 The Eagles fought the St. Johns Tigers to a 9-6 finish in an action-filled game at Harry McMaster field. Jamie Mesics brought in the lone Eagles touchdown with Adam Swientek adding the extra point. Swientek latter added a rouge to bring the Eagles to 9 points. Thanks to all the fans who came out to support the Eagles for Homecoming! The Eagles travel to Winnipeg this Friday to take on the Murdoch McKay Clansmen. The next home game for Football is also the last one of the season, October 23 vs the Oak Park Raiders. Come out and cheer on your Eagles!